Are you ready work with the earth in a sacred way? Michelle has practiced the art of hand tilled Bio-intensive organic agriculture for 30 years, including twelve years managing an acre and half diverse garden at the Occidental Arts & Ecology Center, running a Community Supported Agriculture project at Three Springs Gardens for eight years and in projects overseas in Nepal and Mexico. She loves to educate and inspire people to reconnect with themselves as they engage with the earth. She consults on everything from how to use your body correctly, planting schedules for your region, and how to build healthy and fertile soil. 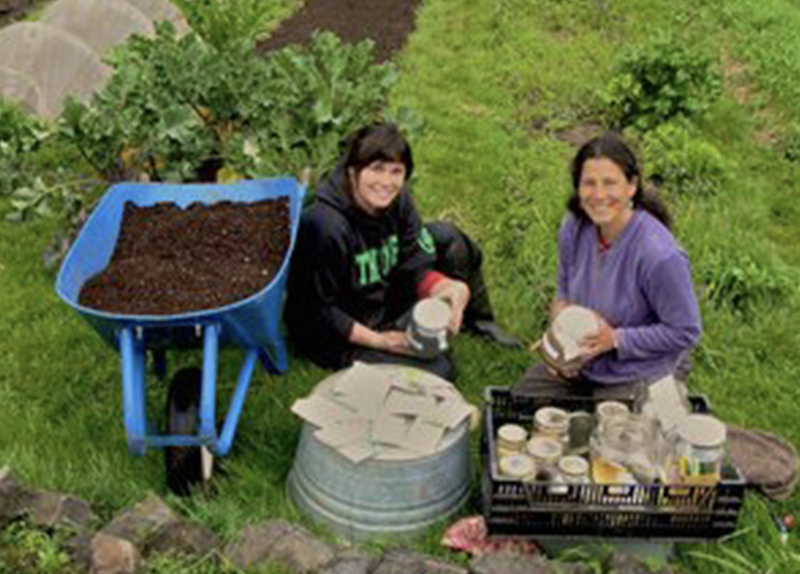 She is available to teach individual, group classes and workshops on organic gardening. 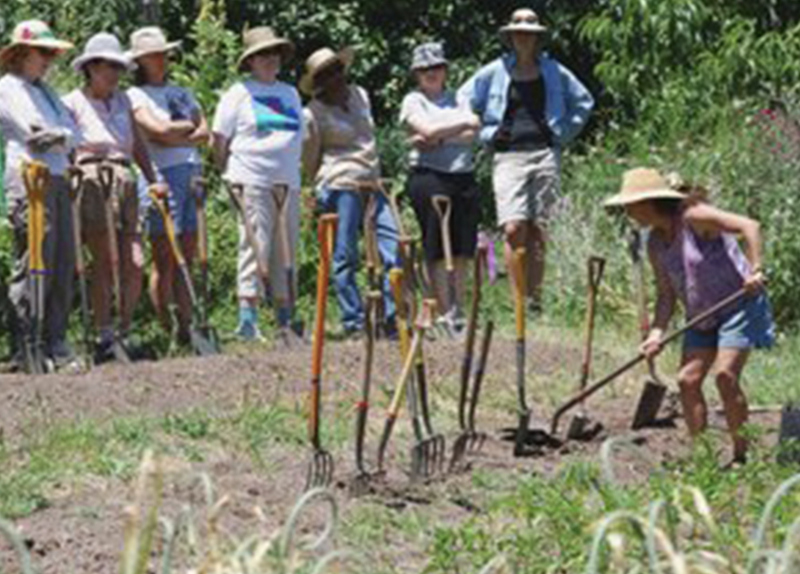 Michelle has taught numerous garden workshops and has worked with over 40 interns to help aspiring gardeners deepen their understanding of tending the earth and growing nourishing food. She can support you in all aspects of gardening including crop planning, bed preparation, composting, seed sowing and planting, greenhouse plant care, natural pest and disease control, and harvesting. She will build your confidence and support you in growing yourself along the way. She can be your personal coach, offer classes, or support your garden program. Are you interested in finding new ways to work with garden tools to ensure that you will not strain your body? Michelle's innovative techniques of the Tai Chi of Gardening has inspired individuals for the past 25 years. Bringing together the principles of Tai Chi, body ergonomics and garden tools, you can build strength and vitality while gardening. Michelle will work with you one on one or in a larger group setting. Have you wanted to slow down to develop a closer relationship with the plant world and learn their healing properties? Michelle offers guidance to connect and communicate with the spirit of plants through meditation and art, opening new possibilities of understanding. She has taught workshops and helped numerous people get to know the plants around them and connect more deeply with their healing and life affirming properties. If you are interested in a garden related service, please contact Michelle. She has sliding scale rates to work with individual needs. "My time in the garden with Michelle has been transformative, to say the least! She has years of experience growing food in a diversity of climates and circumstances, and she has honed the skills and techniques for gardening that will work nearly anywhere. Her love for soil, seeds, plants, and food brings joy and reverence to the work and fosters a deeper appreciation in the gardener. And even more than this, Michelle understands that a garden is as much about the people tending it as it is about any other factor. A garden thrives when we come in the spirit of cooperation, compassion, and learning. With her guidance, I have the skill of growing my own food, as well as gift of being in deeper relationship with the life all around me." "Michelle is an incredible mentor with a vast wealth of knowledge about gardening, nutrition, herbs, body mechanics, and spiritual well-being. Her faith in me as a gardener, and my time working with her, renewed my resolve to pursue gardening as a career. She has been an invaluable sounding board since she understands the challenges and opportunities of both farming for market and in an educational setting. Being able to learn from her keen sense of observation of plants and the land has been crucial to my own growth as a gardener. Her teaching and support has contributed greatly to actualizing my full potential. She is the ideal of what a mentor should be." "Season by season and seed to harvest, Michelle brings passion, joy and heart to her work. She has a creative spirit that encompasses being detail oriented (e.g. garden timing, steps from seed to harvest) and holding the big picture (design, earth centered growing) of growing food and medicinal plants. When you work with Michelle you get a friendly, joyful and direct person who is a great communicator. I have learned an immense amount about growing plants and life in my time spent in the garden with Michelle. I am ever grateful and know you will be too!"